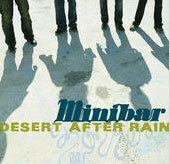 Minibar’s new album, Fly Below the Radar, is like driving slowly along a winding road in the southwestern United States, feeling the heat and the dust and the sun on your head, listening to the deep and melancholy drumming of the engine and the rolling of the tires on the pavement — a melancholic picture of California, as painted by a group of British expatriates. The band — guitarist/vocalist Simon Petty, guitarist Tim Walker, bassist Sid Jordan, and drummer Malcom Cross — moved to Los Angeles from London in 2000, and the move seems to have strongly inspired their music. The spirit of the Southwest is the spirit of the album itself — a collection of dusty alt-country tunes that are simple, catchy, and at times hauntingly beautiful. The album is a drastic change from their last, the slick, big-budget Road Movies, recorded under Universal and produced by Grammy-Award-winning T Bone Burnett. Despite gaining early success and a major-label contract and making the move to Santa Monica, Minibar had trouble with Universal. The label completely ignored Movies, leaving the band to tour with hardly any label support, and their record deal soon caved in. But the band had gained a dedicated fan base, including singer-songwriter Pete Yorn, and a few members of the Wallflowers. Yorn, as the cover of their new album proudly proclaims, has called them “one of the greatest bands I’ve ever heard,” and the Wallflowers were so impressed after hearing Movies that two of the members, keyboardist Rami Jaffee and bassist Greg Richling, co-produced three tracks on Fly Below the Radar, while Jaffee produced another song himself, played keyboard for five of the tracks on the album, and offered them time in his studio. Working in fits and spurts at various studios and with the help and support of some famous musicians, Fly Below the Radar got recorded gradually over the course of two years — in stark contrast to the ten-week, half-million dollar process which produced Road Movies. The experience with Universal forced the band to become tighter musically, and to define themselves — and there is certainly definition to Radar. The first track, “It Is What It Is,” sets the plodding beat and desert tone that remain consistent throughout the entire album. The pace is increased a little with the third song, “New Mexico,” and the tone is made significantly more somber in the acoustic “Badlands,” but mostly every song wallows in a similar sound, making the entire album remarkably whole — and, perhaps for some, remarkably unimaginative. Yet there is a charm to the album. The band doesn’t make much use of instruments other than guitar, bass, drums, pedal steel and keyboard, but there is subtlety to the instrumental parts, which intertwine in understated harmonies with vocals, especially in the beautiful, ghostly “Badlands.” Petty’s voice is deep and rich, and he uses it with grace and control. His singing shows no signs of his British heritage, and instead has a heavy, almost nasal quality, suited for the half-country sound of the album, which almost resembles Beck’s voice in his most recent album, Sea Change. Petty takes control of the tracks, at times deep and dark, and at times sweet and crooning. The lyrics, however, lack Beck’s ingenious wordplay — instead, they are an unsettling mess of deeply depressing poetry. “There’s no Buddha/There’s no guru/There’s no Krishna/There’s no Vishnu/There’s no-one for you to count upon/When Mary, fair of face/The Mother of All Grace/Has disappeared without a trace,” Petty sings jauntily to a distorted guitar and harmonica in “Somebody Down Here Loves You.” Later, in “Fragile,” he sings, “I feel like something’s broken/That can’t be undone/Tall buildings twist and fall/ The storm moves towards us/Like a Holy War.” The music is consistently catchy and rhythmic enough that it makes the lyrics almost unnoticeable at times, which is the only thing saving this album from being remarkably depressing. Minibar is appearing today with Pete Yorn and Jesse Malin at Club Laga at 8 pm. The concert is open to people of all ages. Tickets are $22.